It's no real surprise that there will be at least three Avatar DVDs coming out. The regular release, a special edition, and a possible 3-D DVD. But even the "barebones" release will have plenty of never-before-seen footage. Eat that, Watchmen. 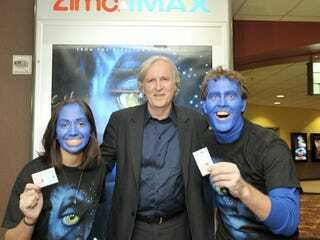 MTV spoke with James Cameron about the upcoming Avatar DVD release, with the first one due out June 30th. And we thought the three different Watchmen DVDs releases were overkill. Also he mentions that the deleted scenes are by no means finished and will look like a "cheesy video game." But we didn't go see Avatar for the FX, it was all about the story and character development, right.... Right? "There are the performances; you can really see what the scene would have been, but it doesn't have that magical realism of the finished film. So to put those scenes in without finishing them... will be for fans. For real fans who want to know more about the characters and so on." That being said, we really just want to see the dirty Earth Jake left behind.